Applesauce Gets a Kick to the Core! 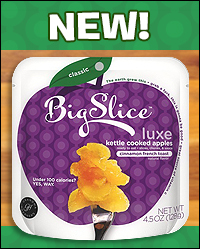 Big Slice Kettle Cooked Apples - This conveniently pouched, chunky, home-style fruit comes in 16 AMAZING flavors. There are three different lines: Pure (simple picks like Natural and Cherry Vanilla), Fit (including Pineapple Passion Fruit & Fiber) and Luxe (with our favorite, Cinnamon French Toast!). Each package has 50 - 170 calories, 0 - 8g fat, 0 - 10mg sodium, 13 - 27g carbs, 2 - 5g fiber, 10 - 23g sugars, and 0 - 5g protein (PointsPlus® value 1 - 5*). FYI, the Banana Mango & Hemp Seed version is the only one with over 110 calories. At select Target locations -- click to find! Eggo Bites - OH WOW. These are tiny French toasts (in Vanilla or Cinnamon) and waffles that come in microwaveable pouches! Eat 'em on the go -- the waffles even have maple-syrup flavor cooked right in. We reiterate: WOW. Each pouch has 180 calories, 5g fat, 230 - 280mg sodium, 29 - 30g carbs, <1g fiber, 9 - 11g sugars, and 4g protein (PointsPlus® value 5*). 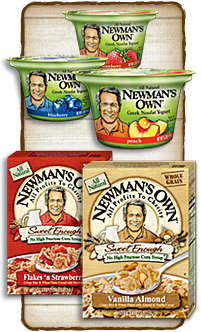 Newman's Own Branches Out with Greek Yogurt & Cereal! Newman's Own Sweet Enough Cereals - A super-smart alternative to all the too-sugary cereals out there, these lightly sweetened cereals are all-natural and packed with whole grains. Vanilla Almond, Honey Flax Flakes, Flakes 'n Strawberries... They all sound good to us! Especially since each 3/4-cup serving has just 100 - 110 calories, 0 - 1g fat, 80 - 130mg sodium, 24 - 25g carbs, 2 - 4g fiber, 7 - 8g sugars, and 2 - 3g protein (PointsPlus® value 3*). How could those single-cup coffee brewers be any better? 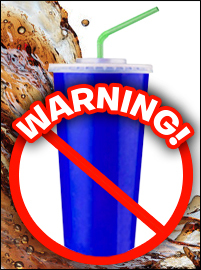 With BIG cups and foam that's practically calorie-free! 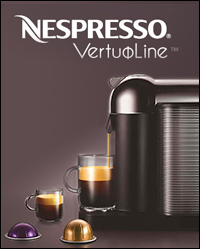 VertuoLine, coming soon from Nespresso, will serve up authentic espresso as well as "American-style large-cup coffee," both with crema, a foam made from the coffee itself. Fancy, fancy business! ***It's coming... It's getting closer... The Hungry Girl Diet hits store shelves on March 25th, which means it's nearly PRE-ORDER PROMO TIME! Do NOT miss a special email WEDNESDAY with the details on this year's book promo. Hint: You only need to buy ONE copy of the book to receive more than $30 worth of freebies!!! Stay tuned... Book tour dates coming soon, too. WOOHOO! ***Boston Market steps up again! This time, they've lowered the sodium in several popular menu items. The mashed potatoes now have 26 percent less salt, and the sodium in the poultry gravy has been halved! Click to read up on the rest of the changes, and check out the "550 calories and under" meals before you order! ***We love yogurt, and a new study has found the probiotics in yogurt may aid weight loss in women. Yay for that! Sorry, guys -- the probiotics had no noticeable effect on the men's weight. And that's all we've got. HG out! Make sure your friends know to look out for Wednesday's pre-order promo! Click "Send to a Friend," and pass around this useful info. Today, February 24th, is National Tortilla Chip Day. Sure, we love store-bought baked tortilla chips, but have you ever made 'em yourself? SO EASY!